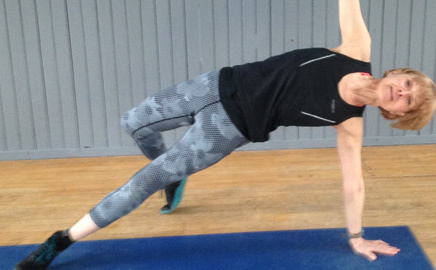 Hi and Welcome – I’m Susan, an experienced Fitness Instructor who specialises in teaching Fitness Pilates, Yoga and conditioning classes for men & women. I’m motivated, enthusiastic and committed to helping you achieve your fitness, health and lifestyle goals so come and join us and be part of our Complementary Fitness journey. Welcome to Complementary Fitness, I’m Susan, an experienced Fitness Instructor who specialises in teaching all-level Fitness Pilates, Freestyle Fitness Yoga, PiYo (fitness Pilates/Yoga combo), resistance, strength & toning classes for men & women. I’m motivated, enthusiastic and committed to helping you achieve your fitness, health and lifestyle goals so come and join us and be part of our Complementary Fitness journey. I look forward to working out with you in our community based classes where you’ll find a variety of classes to help you improve your core and overall strength, posture, balance, flexibility and co-ordination. We offer all level, effective and fun classes for men and women in Craiglockhart and Colinton, Edinburgh. Book/come along and join us in our Fitness Pilates class (Tue 7.30pm Craiglockhart Church Hall), Resistance Body Conditioning Workouts (Wed 9.30am Dreghorn Loan church hall, Colinton), Fitness Pilates/Yoga (Thurs 7pm Dreghorn Loan hall) and Freestyle Fitness Yoga classes (Fri 9.30am Dreghorn Loan hall). Click on the Classes Where/When page for info about dates, times and venues. I look forward to welcoming and working out with you soon to help you achieve your results, goals and targets. Complementary Fitness classes are more than ‘just fitness’ – our all-level classes are effective, friendly and fun with lots of options and variations to suit all. I hope that you’ll become one of our ‘regulars’ – some class participants have been with us for 20 years!! Did you know that exercise can improve your posture, build strength, flexibility, body confidence and also affect your mindset: regulating your mood and helping you feel positive too? It’s a great stress-buster and can help you clear your mind, feel more focused and happier. We hope you’ll be part of our journey to feeling amazing and having more energy. All classes are for woman (except pregnancy) and they’re for all Levels including beginners. Please sign up to our weekly Fitness Newsletters on the top right corner of the News Page which give lots of current and up-to-date info and tips. Click About Susan and how she can help you achieve your goals. Read our Articles, Comments and Fitness Newsletters for more info about Complementary Fitness. To email for details – click on the Contact Page and we’ll get back to you asap. “After my first class, it’s made a huge difference to my posture, back pain is hugely reduced which is unbelievable! I love your wonderful teaching and caring approach thanks”!